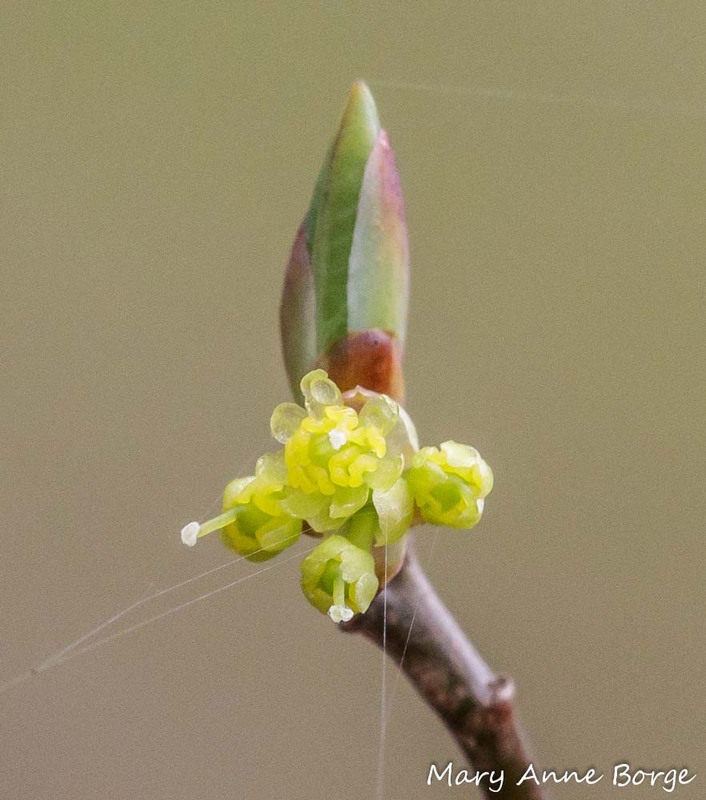 For the past few weeks, Spicebush (Lindera benzoin) buds looked like they couldn’t wait to open. Over the weekend when the temperatures reached 80°F in the latest round of weather whiplash, the buds burst open, resulting in a display of bright yellow starbursts lighting up the forest understory. 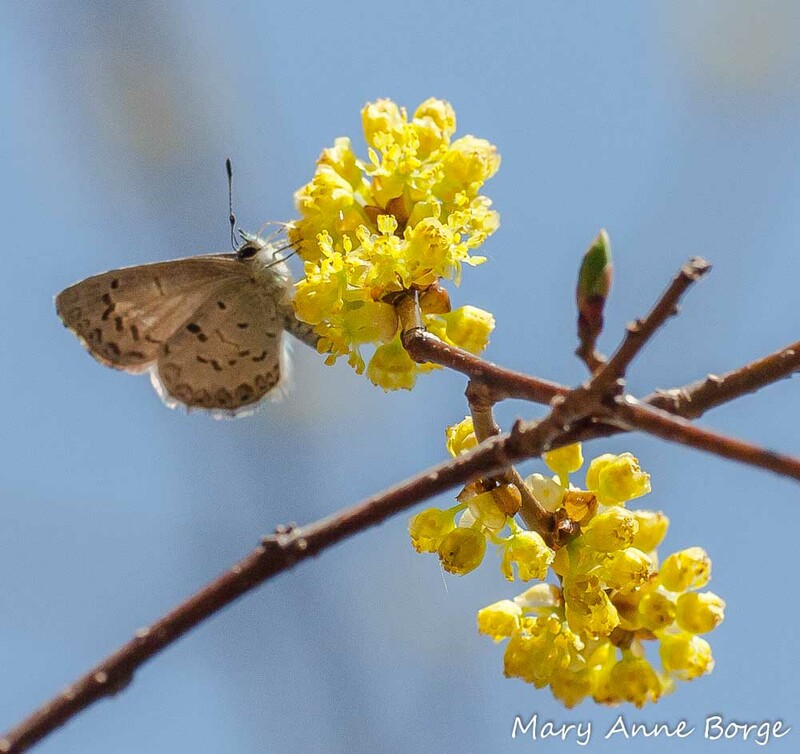 Spring temperatures have a big influence on the exact timing, but where I live in the mid-Atlantic United States, Spicebush typically blooms in late March or early April, at about the same time as forsythia. 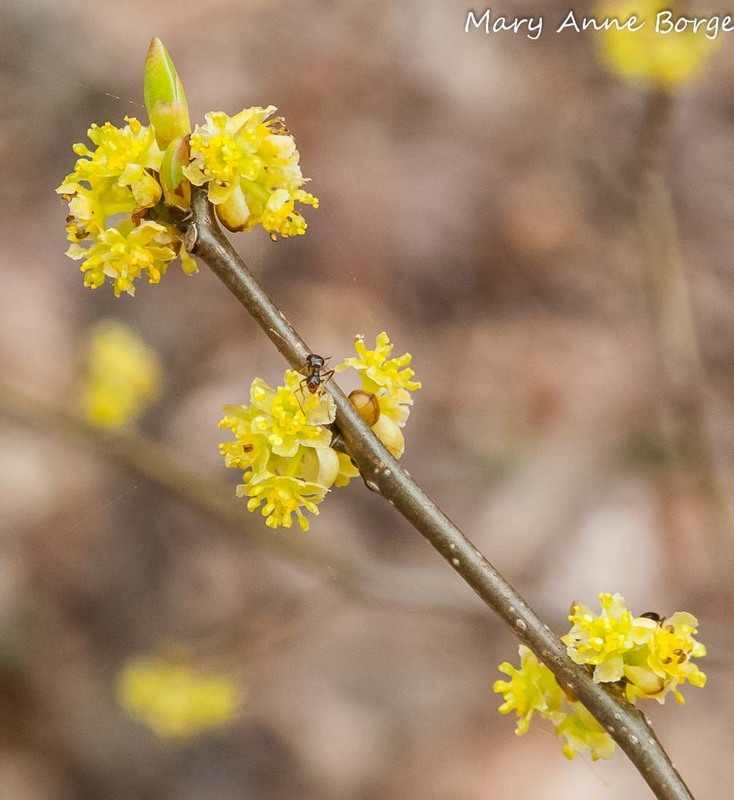 Forsythia is also lovely for the ten days or so that it’s in bloom, but then it’s a little, well, boring, when compared to Spicebush. Sometimes called Northern Spicebush or Common Spicebush, this shrub is native in the north from Maine to Ontario, Michigan, Iowa and Kansas, then its range extends south to Texas and throughout the southeastern United States to Florida. It can generally be found in woodlands, but works well as a landscape plant, too. Spicebush gets its common name from the spicy aroma emitted from its leaves and young branches when they are rubbed or crushed. 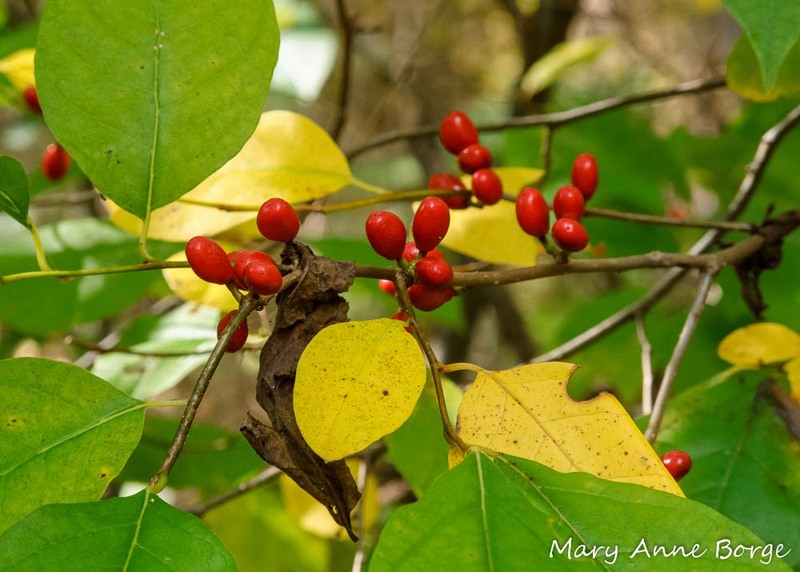 Where Spicebush is native, it has important relationships with animals that have evolved with it over the centuries. Many insects, including early butterflies, visit the flowers for nectar, but early solitary bees and flies are the primary pollinators. The flowers bloom before the leaves unfurl, making it easy for pollinators to find them. 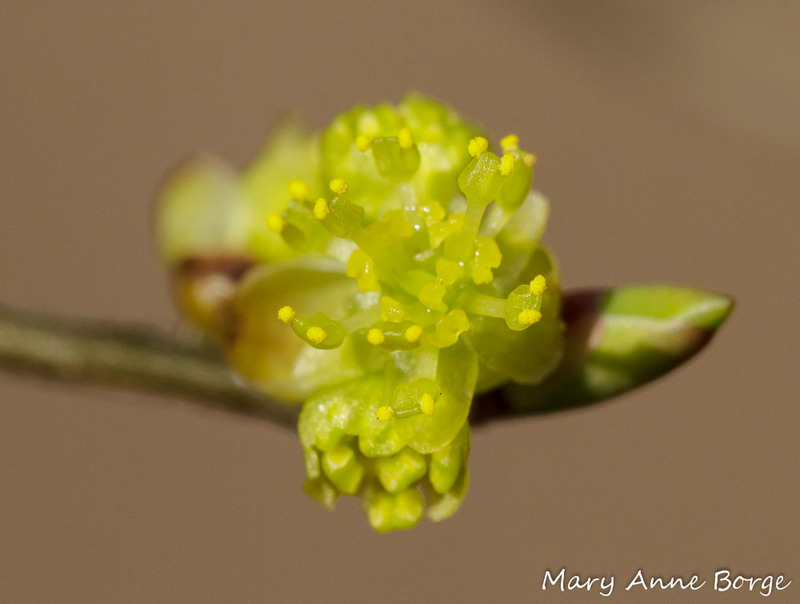 Spicebush has male and female flowers on separate plants. So if you are using them in your landscape, you will want a male to pollinate the female plants in order to see the bright red fruits that complement this shrub’s yellow fall foliage. 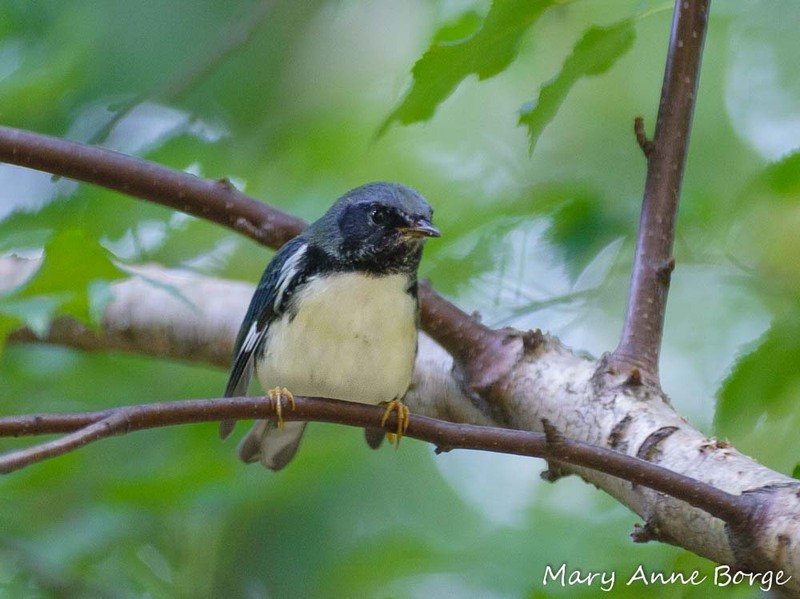 birds that are often found in the same habitat as Spicebush, are especially partial to them. but they can also be found in the woods in the vicinity of their namesake plant, Spicebush. 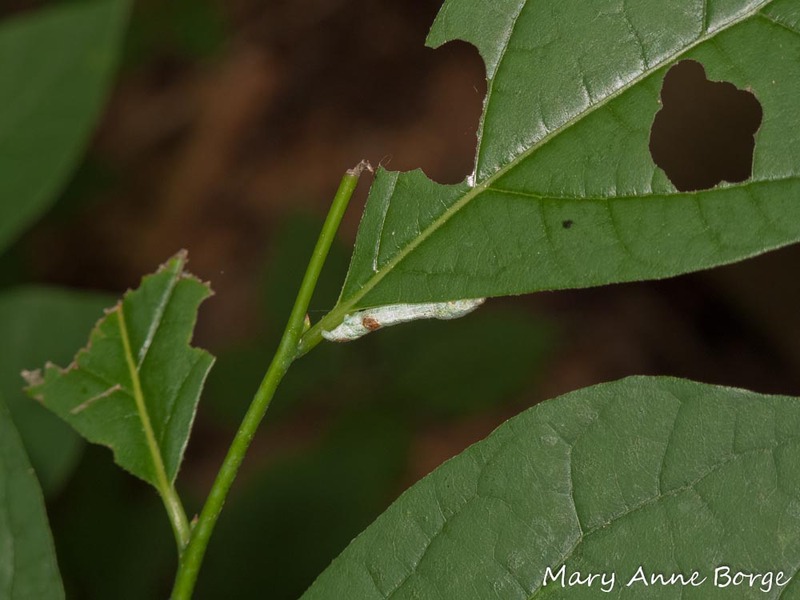 This is because the primary food plants for Spicebush Swallowtail caterpillars are Spicebush (Lindera benzoin and in the southern U.S., also L. melissifolia) and the related Sassafras (Sassafras albidum), which is usually found in the same type of habitat. Without these plants we wouldn’t have this lovely butterfly, since its caterpillars can only survive on the leaves of a few plant species. 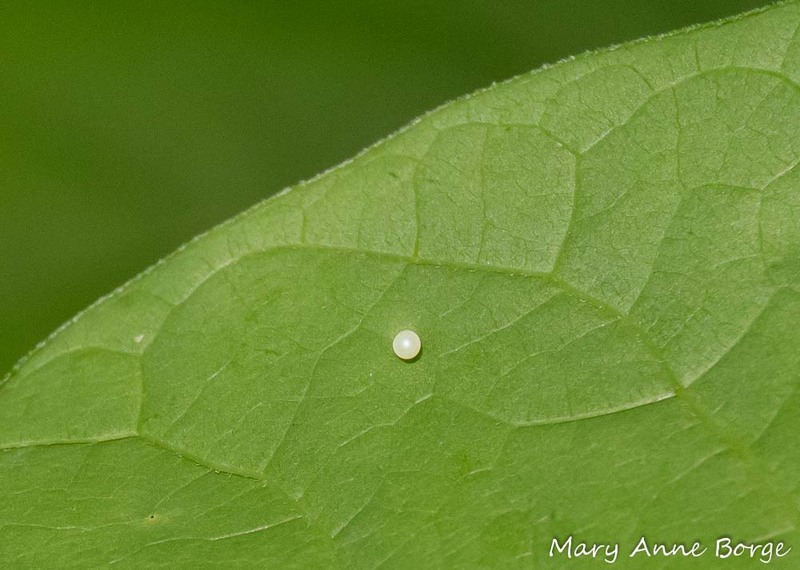 Female Spicebush Swallowtails lay their eggs singly on the underside of a leaf. After the caterpillars hatch from the eggs, they depend on the leaves of these plants for both food and shelter. 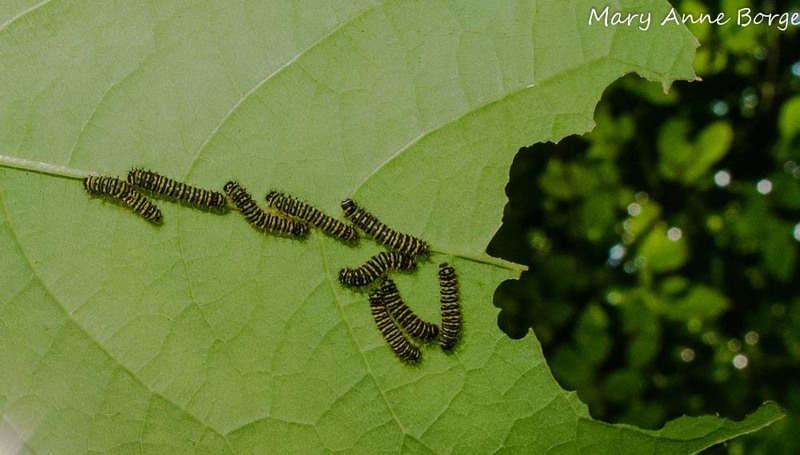 Each caterpillar eats a few leaves of a Spicebush during its development. Looking for holes in leaves is one way to find these caterpillars. But we’re not the only creatures who have figured out this strategy for locating them. 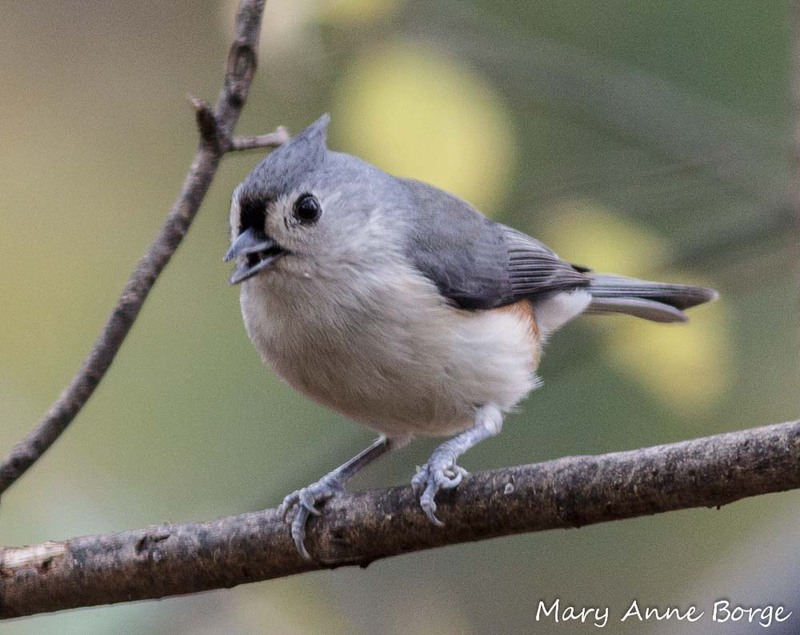 Caterpillars and other insects are an important source of food for birds, especially when the birds are raising their young. 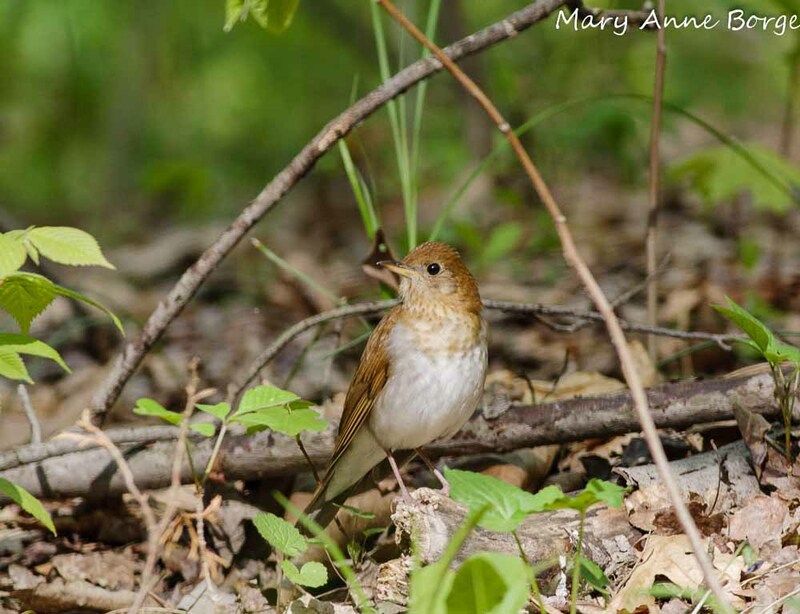 Some bird species also know enough to look for partially eaten leaves to point them to a tasty meal of caterpillar protein. So the caterpillars have evolved to protect themselves by destroying the evidence of their dining experience. While I watched, this caterpillar crawled to the stem of the leaf it had been eating. It chewed through the stem, and the incriminating evidence, the partially eaten leaf, fell to the ground. 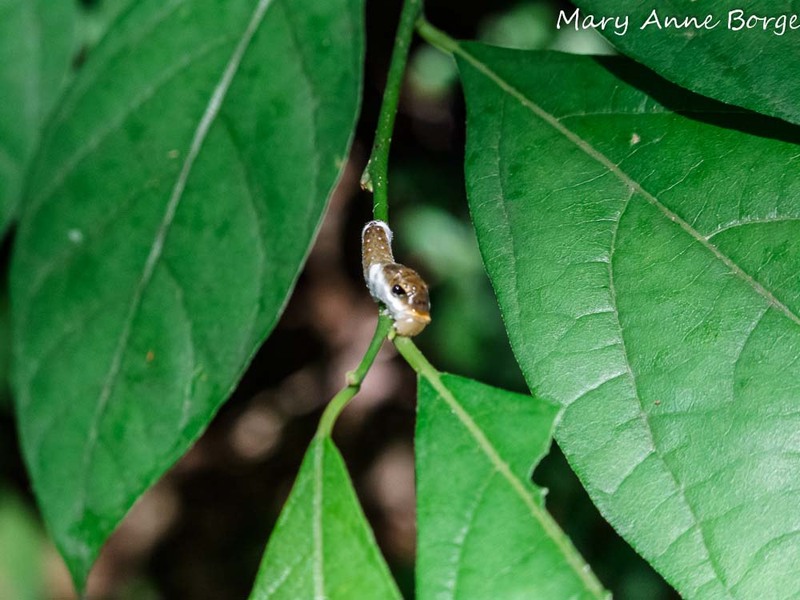 Spicebush Swallowtail caterpillars have other strategies to protect themselves from predators. In their earliest growth stages they look like bird droppings, a clever disguise to deter birds from eating them. As they grow, they take on the appearance of a snake, with false eye spots above their real head. This snake disguise is an effective deterrent to at least some of the birds that might otherwise eat the caterpillars, since snakes are the birds’ predators in their wintering grounds. 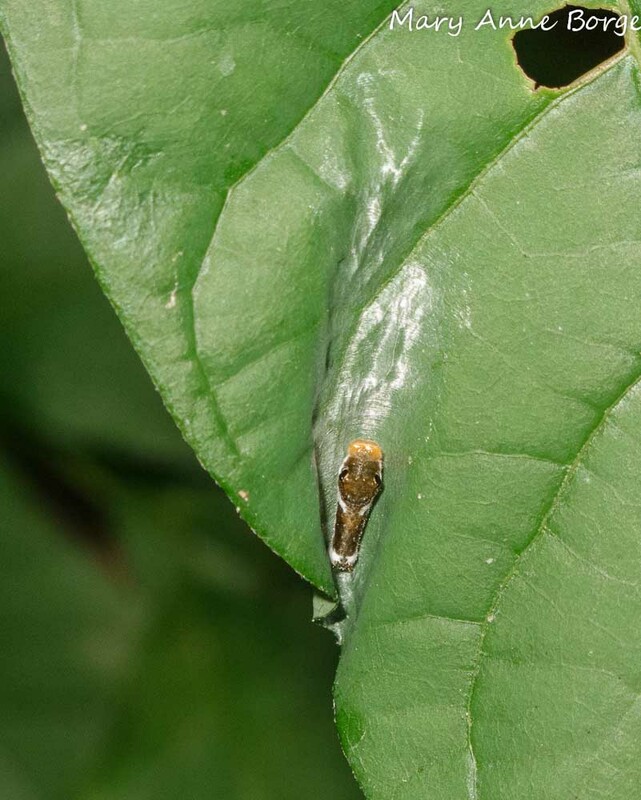 When they’re not eating, Spicebush Swallowtail caterpillars hide in leaf shelters that they create for themselves by spinning silk to pull two sides of a leaf together. and one of the giant silk moths, the Promethea Moth. Winter is a good time to look for Spicebush Swallowtail chrysalises and Promethea Moth cocoons, since these species overwinter as pupae. Forsythia on the other hand, primarily a native of Asia, doesn’t support any of our native insects and birds in this way. So I’m opting for Spicebush. 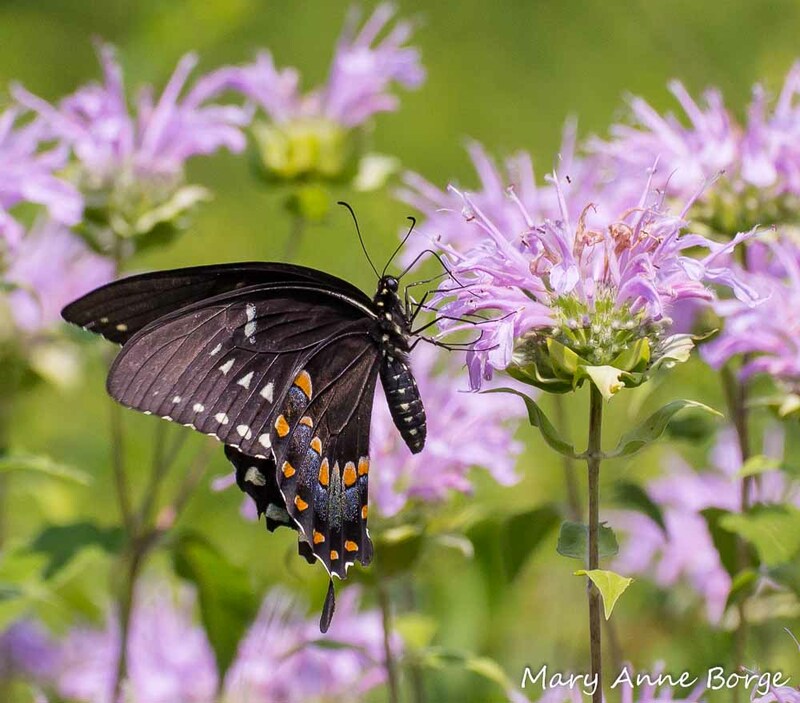 This entry was posted in Birds, Butterflies, Gardening for Wildlife, Native Plants, Other Insects and Spiders and tagged caterpillars, Lindera benzoin, nature, Spicebush, Spicebush Swallowtail Butterfly by Mary Anne Borge. Bookmark the permalink. Great article Mary Anne! (even w/ me being 5 years late to see it – LOL). 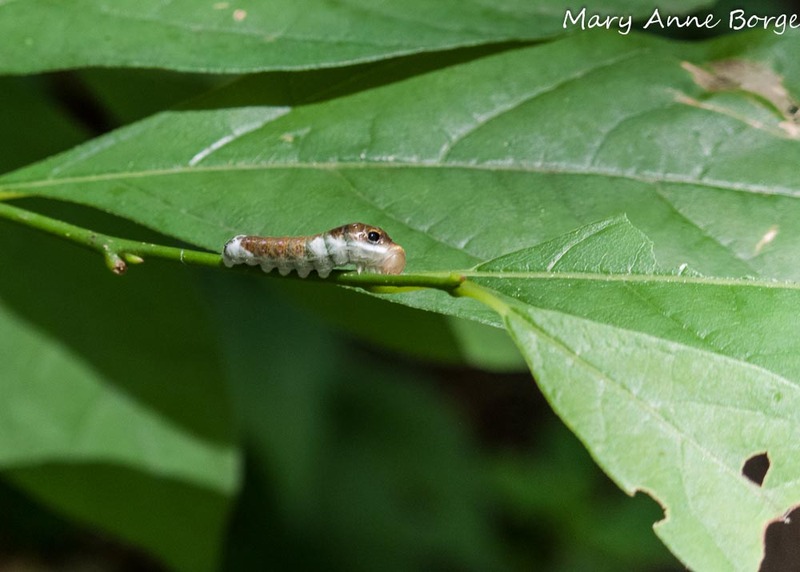 The tidbit on Spicebush caterpillars cutting off partially-eaten leaves is fascinating (& new to me) – many thanks! Glad you enjoyed it! Fortunately, the info doesn’t have an expiration date. I hope you enjoyed the Trees in Winter class. Fascinating photographic record of, among other delights, the behavior of the spicebush swallowtail caterpillars. Such a pleasure to visit & revisit your posts, as I study for Bowman’s tours. The photos are so very beautiful. Thanks, Monica. I’m glad you find the posts helpful. thanks Mary Anne for sharing…..II always look forward to seeing your posts!! !…miss you…. Thanks, Patti! See you soon?! What a beautiful and informative blog! I found it thru a fb post by Virginia Native Plant Society; so glad! Thanks, Laura! 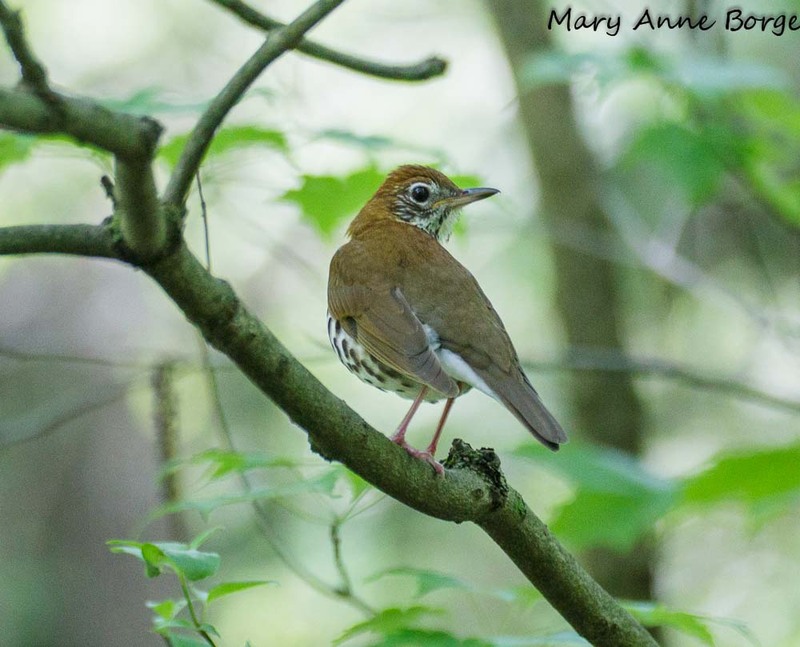 And thanks to the Virginia Native Plant Society for sharing my post. As always an interesting, informative article! I have no forsythia only spicebush. (small) I can’t wait until they bloom. In the woods, behind my house, there is a beautiful spicebush blooming now. I’m looking forward to seeing a spicebush swallowtail butterfly soon. 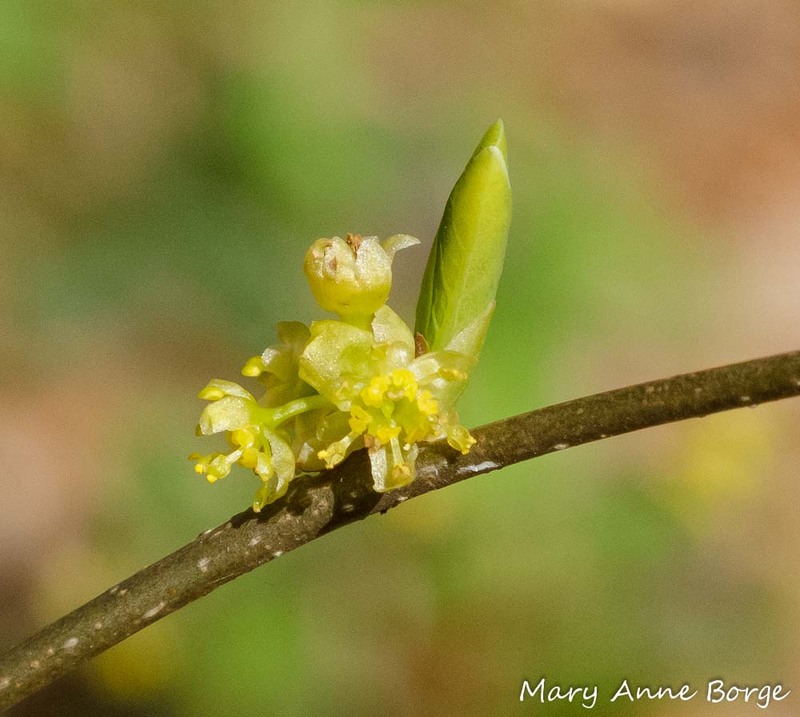 Imagine my surprise when I saw this talented photographer’s spicebush photo on the Virginia Native Plant Society’s Facebook page. Way to go Mary Anne! Thanks, Kathy! I expect we’ll see Spicebush Swallowtails when the leaves start to unfurl. Not long now! That’s great, Michelle! I watched the egg pictured in this post being laid. It was so exciting to see!